Over the decades Soldiers and Airmen have served the Ohio National Guard (ONG) with a tradition of honor and dedication. The Adjutant General’s intent for the ONG Alumni Relations Program is to provide information, communication and liaison with retirees and other alumni who want to stay connected with the ONG after retirement or separation. This program is not intended to take the place of existing support programs and retiree/alumni groups, but rather to serve as a communication link between the ONG Command Group and alumni, and to coordinate programs of general interest such as the Adjutant General’s Alumni Reunion. 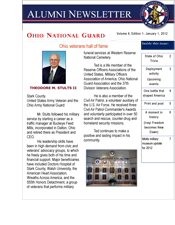 Who qualify as Alumni of the Ohio National Guard? Any Soldier or Airman who is a retiree or who has completed a term of service with either the Ohio Air or Army National Guard qualifies as ONG Alumni. Many alumni already belong to unit or wing associations. This program will not take the place of those local associations, but will work cooperatively with them. There are no dues or other requirements to register with this program. All we need is your contact information, which you can provide us by completing the on-line form. The information you provide will not be shared with other organizations unless specifically approved by the ONG and the provider of the information. By registering with us you will receive periodic newsletters and other update information about ONG units, events and activities which may be of interest to you. If at any time you chose to opt out, you will not receive any further information from us. However, we hope you will find this program to be of use to you and a source of valuable information about your Ohio National Guard. By submitting an ONG Alumni Relations Program Enrollment Form, you will receive the Ohio National Guard alumni newsletter and an invitation to the annual reunion. The newsletter will help you stay informed about new important benefit programs and other happenings that could affect you.